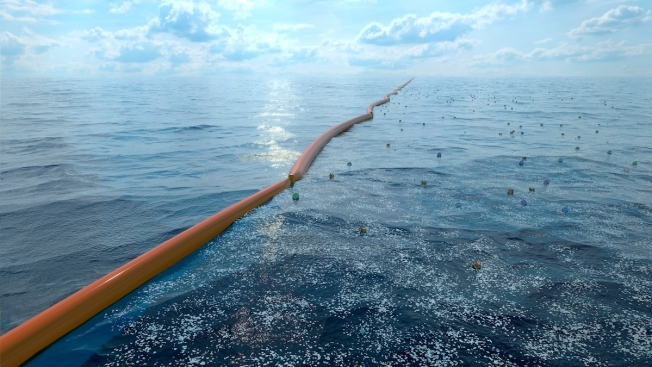 This computer-generated artists' illustration provided by The Ocean Cleanup shows how a floating barrier and collection station might appear in a project to collect plastic garbage from the world's oceans. A team of researchers, sponsored by The Ocean Cleanup, an organization founded by 21-year-old innovator from the Netherlands, are studying the plastic waste in an effort to eventually clean up what's known as the Great Pacific Garbage Patch. A trash collection device deployed to corral plastic litter floating in the Pacific Ocean between California and Hawaii has broken apart and will be hauled back to dry land for repairs. If it can't be repaired there, it will be loaded on a barge and returned to its home port of Alameda, California. Slat said he's disappointed, but not discouraged and pledged that operations would resume as soon as possible. "This is an entirely new category of machine that is out there in extremely challenging conditions," the 24-year-old Dutch inventor said. "We always took into account that we might have to take it back and forth a few times. So it's really not a significant departure from the original plan." Which Is Bigger: Great Pacific Garbage Patch or Your State?